Hermione Jean Granger — the cleverest witch of her age, coolest girl in the world, true hero of the Harry Potter series, and OG Nazi-puncher — turns 39 today. 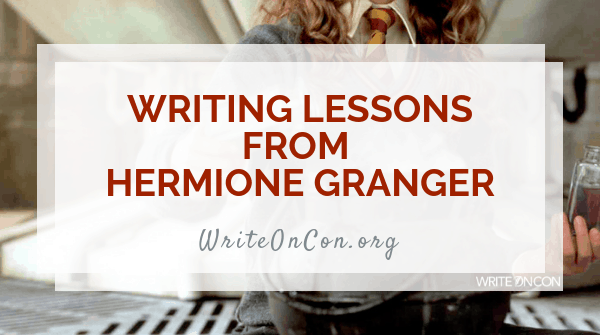 While Hermione preferred to read books instead of write them, there are still many lessons that writers can learn from her. So break out your quill and parchment, because in honor of her birthday, here are four writing lessons inspired by the Patronus saint of magical book-lovers herself. I probably don’t have to tell you that you should be reading, but another way you can channel your inner Hermione is by studying the craft—writing craft, that is. There are hundreds of craft books out there, but to get you started, I’m going to be the millionth person to recommend On Writing by Stephen King. Tomi Adeyemi, author of Children of Blood and Bone, also offers several free writing courses on her website.Another way to study craft is to reread. One technique I’ve done is going through favorite books and writing an extensive synopsis chapter-by-chapter. On the first read, you’re often dazzled by the world and the writing and reading to see what happens to the characters, but when rereading masterfully crafted books after you already know what happens, it can be remarkable to see how tightly and carefully the major plot, character, and thematic arcs are being developed and foreshadowed each chapter. Reading screenplays can also be very informative, as they’re essentially incredibly in-depth outlines — and movies are much more highly condensed mediums than novels, with far less room for fluff. I’m sure all writers would love to have a Time-Turner to meet deadlines or word count goals. Hermione’s work ethic is certainly something to admire, but don’t forget that Harry Potter and the Prisoner of Azkaban actually ended with her returning her Time-Turner and dropping classes because she was just too overwhelmed. Remember: if Hermione Granger can’t meet every single one of her goals even with a Time-Turner, there’s no reason us Muggles can. So work hard and dream big, but don’t overexert yourself or beat yourself up if you can’t always get everything done. After seven books of Hermione doing all the work, it can be easy to forget that when we first meet her in Harry Potter and the Philosopher’s Stone, no one liked her, considering her a bossy know-it-all. But of course, those exact qualities that seem over-the-top and annoying at first come in handy later when her curiosity and studiousness end up saving the day again and again and again. If you’re worried that your writing or stories are too weird, consider that those very qualities might in fact be what make them unique. It’s so easy for writers to get stuck in our own heads. But take this lesson from Hermione to heart and remember the important things. Whether they’re your critique partners, writing buddies on social media, or your non-writing friends, family, and partners who support you, remember to take a break from your writing once in a while to appreciate the people around you who support you on your journey. Do you relate to Hermione? What lessons have you learned from her? Let us know in the comments!